It’s been over a month now since I finished my Charity Insights internship with Sense About Science and amidst the hectic nature of freshers week and returning to university I have been reflecting on the experience. Before my internship I was interested in the work done by SAS and I knew a lot – or at least I thought I did – about the interplay between science, society, politicians and the media. Since my internship I have come to realise that the issues and solutions are much more complex, but also much more interesting. 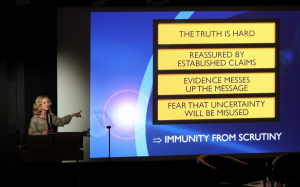 This idea was always stewing in the back of my mind during my time at SAS and was really brought to the forefront when I was fortunate enough to be able to attend the 2015 Sense About Science lecture: The Ugly Truth. The lecture was delivered by managing director Tracey Brown, a podcast of the lecture is available here as well as a comment piece written by Tracey for the guardian. The event was attended by leading figures in the world of Science and Policy, including my former head of department Prof. Joanna Haigh, author Simon Singh and hosted by Dr Adam Rutherford. 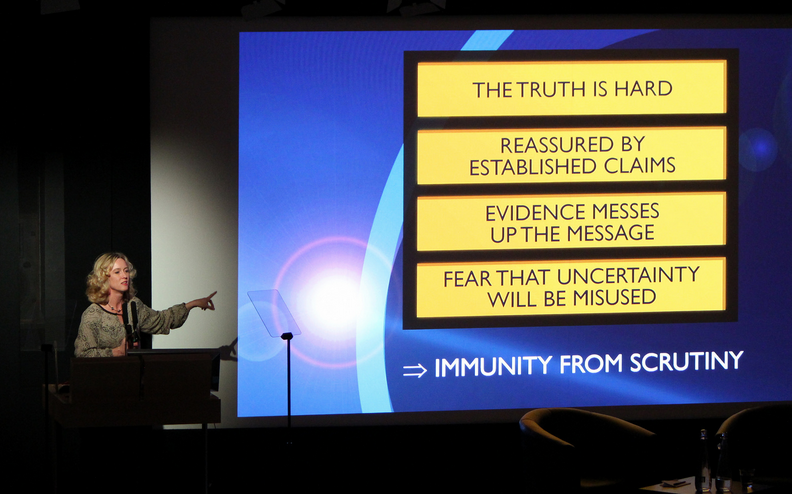 The lecture essentially focused on the way scientists struggle to tell the truth. Often it can be hard to tell, such as in the case of those seeking miracle cures. At other times it is oversimplified in an “ends justifies the means” approach, do we only need 5 fruit and veg? what is the real limit on alcohol? Is it just better to tell people what to do than give any real evidence? Tracey’s argument was that scientists and the media need to be more open about uncertainty, because dumbing it down or worse acting as if we know everything only makes the truth, when it does emerge, harder to believe. The lecture was thought provoking and I advise anyone reading to have a listen. Tracey explains deftly how there are so many facets in promoting good science in our society. It’s not just about tackling quack science, but trusting the public to make sense of evidence and uncertainty. I was lucky enough during my internship to take an active roll in this speech, attending the team meetings for which it was outlined, discussed and debated, and also researching aspects of the speech. Sitting in the audience I was surprised to see pictures I’d found an case studies I’d examined being used. After the lecture I was also able to speak in person to members of the Energy Panel and thank them for all their help. I also spoke with previous SAS interns, many of whom are studying for PhDs. Before my internship I was uncertain about a career in science communication and policy, what it would entail and whether it would be interesting. I now know for certain that it is not only interesting, but constantly changing and I’m excited for the challenges it will involve. I’m very fortunate to have had the chance to work with the dedicated, passionate and inspiring team at Sense About Science, I’d like to thank them all for making my internship so enjoyable. I’d also like to thank those who work for the Charity Insights scheme for making it all possible. If you have the chance I would urge you all to apply for charity insights, it will easily be the best thing you do all summer.